There are outlines for several initiatives in WHIN's proposal, but not a lot of specifics yet. A ten-county area of West Central Indiana is about to get a nearly $40 million investment from the Lilly Endowment aimed at making farming and related industries more internet-compatible. 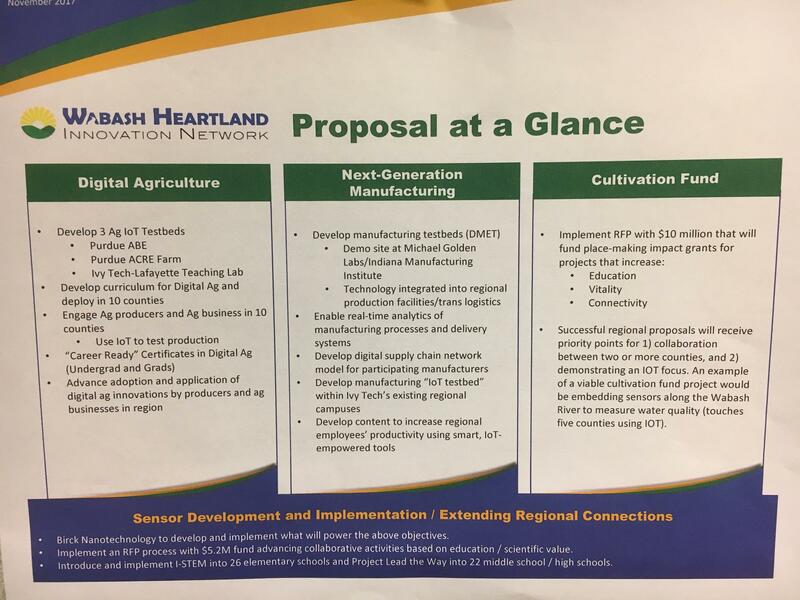 The cash is going to the Wabash Heartland Innovation Network, or WHIN (pronounced “win”), which will send the cash to Purdue University as research seed money. WHIN, which includes Purdue President Mitch Daniels and several Purdue trustees, will send the cash to the school’s Birck Nanotechnology Center, where much of the research will be done. But the issue of what will be invented is still very much up in the air. WHIN board member Todd Miller is the CEO of Myers Spring, a Logansport spring manufacturer. He says he can envision ways his company might benefit. Daniels says he believes the entire region can benefit from the resulting work. The money is designed to link more devices to the so-called “internet of things,” so those devices can provide real-time information to users. Many of those devices could be used to help farmers, but would be made by industries not directly connected to farming. That’s why Crawfordsville Mayor Todd Barton says he’d like more information about who, exactly, will benefit from the grant. Purdue plans to create what it’s calling “testbeds” where new technology could be tested. Professors will also create new curricula for digital agriculture that can be shared with students and farmers across the ten-county region WHIN represents.